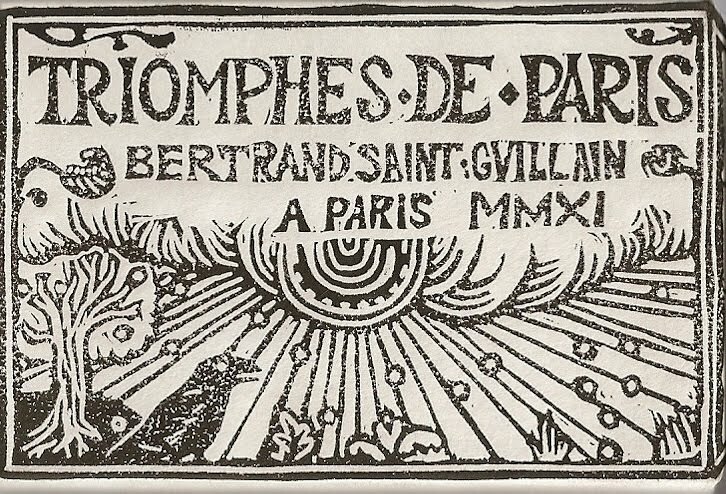 The Triomphes de Paris is a black and white Majors only deck of 22 cards plus 2 extra title cards and a card with the deck number and a hand protruding from a cloud. 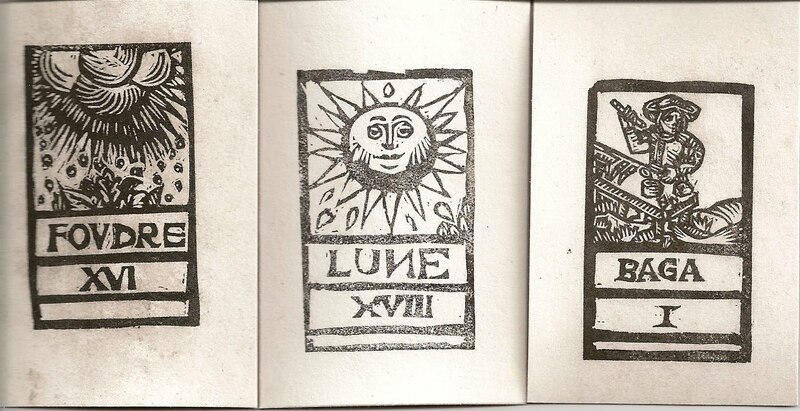 It is made with linoleum engraving methods, printed by hand and glued by hand; an attempt to create a Ltd edition and numbered deck using only the 17th Century cardmaker’s technique. 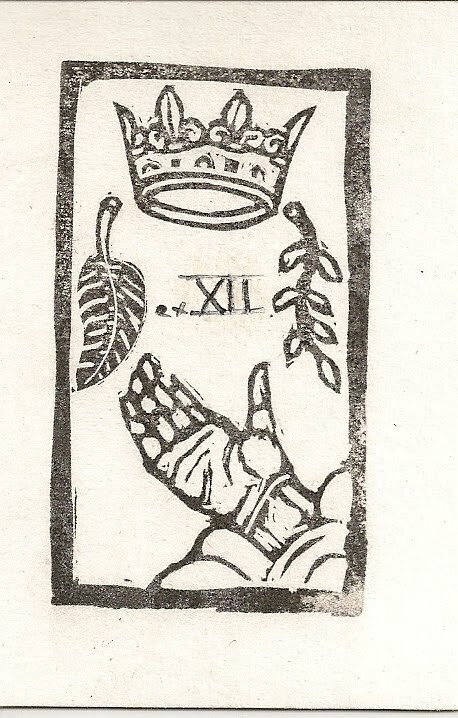 The deck comes in a card wrapper such as was used in card manufacturing of the 17th Century . 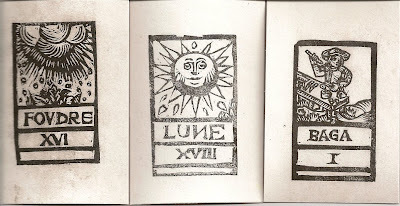 This page : http://www.tarotparis.com/archives holds accurate information about all six series of the first edition of those handmade decks (specifications, date of fabrication). My copy is from the second series. The cards are inspired by the tarot from Jacques Vieville - master cardmaker in Paris up to 1643. 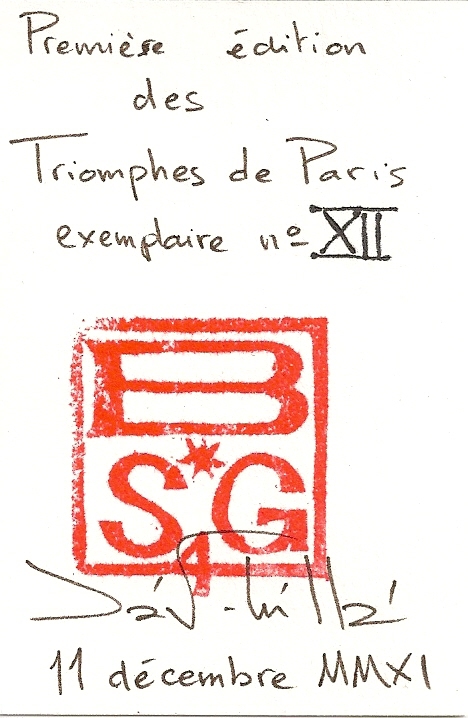 As the Vieville it used slightly different order and naming of the trumps and it reproduces the Vievilles famous, backward, mirror-image letters “S” and “N”. Justice and the Chariot are permuted, VII and VIII, so are the Hermit and Strength, XI and IX - not VIIII as in other french Tarots, but IX, a numeration Vieville also uses on the card XIX (Sun). The Death card (XIII) is unnamed, Tempérance is renamed Dame, the Hermit is renamed Vielart. The fool and the Mountebank are called MA (for Mat) and BAGA (for Bagat, derived from the italian form of Bateleur). The XVIth card, usually "Maison Dieu" (the tower) is replaced by LA FOVDRE (thunder).